Powis Castle Gardens at Powis Castle01938 551929work GardenPowis is one of the few Baroque gardens to survive almost intact since the 1680s. You can wander the grand Italianate terraces blasted from the solid rock. The combination of terraces, formal and informal gardens make the Garden at Powis a delight for enthusiasts as well as lovers of beauty and tranquility. The Garden is of the highest horticultural and historical importance. 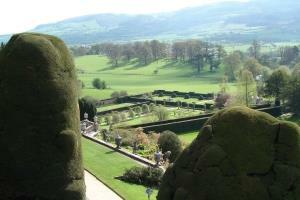 Powis is one of the few Baroque gardens to survive almost intact since the 1680s. You can wander the grand Italianate terraces blasted from the solid rock. See the 30ft high yew hedge, dancing statues and lavish herbaceous borders. The sweet scent of flowers fills the air - whatever the season. To 26 March 10:00 - 16:00, 27 March - 1 Oct 10:00 - 18:00, 2 Oct - 31 Dec 10:00 - 16:00 (closed 25 Dec).